Integrated Packaging Corporation, Dba. 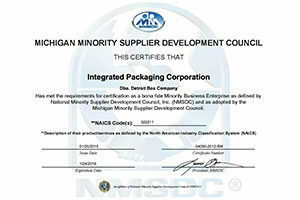 Detroit Box Company, has met the requirements for certification as a bonafide Minority Business Enterprise as defined by National Minority Supplier Development Council, Inc. (NMSDC) and as adopted by the Michigan Minority Supplier Development Council. and save this certification for your records.